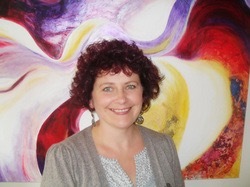 I am a contemporary painter and textile artist living in West Wales. I take my inspiration from the world around me. Using flowers, the cycle of nature and the landscape behind my home as a catalyst, I enjoy emulating my love of colour, shape and surfaces in paint and other media. Being experimental in my approach, I relish playing with new processes. I have developed my own style of work alongside school and community projects and enjoy facilitating groups to engage in the making process.